The FPUR600 Series has been discontinued. Please contact our Flow and Environmental department for possible substitutes. FPUR600 Series rubber impeller pumps output a relatively constant flowrate regardless of outlet pressure. They are intended for use with liquids of less then 50 SSU viscosity and can easily tolerate small (1/4" max) entrained solids. The FPUR606 and FPUR611 include a macerator to chop up easily shredded contaminants such as leaves, seaweed, etc. Choose pumps with open drip-proof (ODP) totally enclosed fan-cooled (TEFC) or gasoline motors. All motors are rated for continuous duty. AC units operate with 60 Hz, single-phase power, and all (up to 3/4 HP) come with a 6-ft, three-wire cord and plug for 115 Vac (the 1 HP motor should be hard-wired due to amperage draw at 115 volts). For 115/230 Vac units, the customer must rewire the power cord and a suitable plug for 230 Vac. The 230/460 Vac units must be hard-wired by the customer. 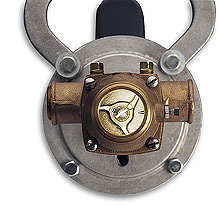 The FPUR600 series pumps must be primed to prevent dry running of the impeller. Suction lifts up to 15 feet are possible with pump fully primed. FPUR604 through 606 have lip seals; FPUR609 and 611 have mechanical seals and also include a vacuum switch to insure that the pump won’t run dry if liquid isn’t being pulled through the pump. The FPUR604 through FPUR606 include male threads to accept 3/4" standard garden hose, and also have female NPT ports. The connections for the FPUR609 also accepts 11/2" I.D. hose; connections for the FPUR611 also accepts 2" I.D. hose. *Models FPUR609 and FPUR611 include a vacuum switch to insure that the pump won’t run dry if liquid isn’t being pulled through the pump. †Models FPUR606 and FPUR611 include a macerator to chop up easily shredded contaminants. 참고: *Pump no longer available.